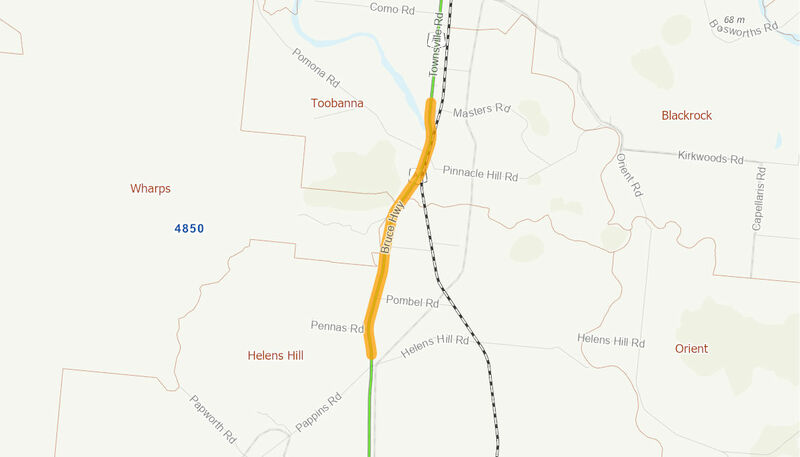 The project involves the upgrade of a 5.8 km section of the Bruce Highway, from just south of Pappins Road/Helen’s Hill intersection to just north of Pomona Road intersection as a two lane, undivided carriageway. This project will construct a new 644 metre long bridge over Cattle Creek, replacing the existing low-level bridge, and construct a new, higher-level section of the Bruce Highway from Cattle Creek to Pomona Road, south of Toobanna. The project will also upgrade the existing Bruce Highway from just south of the Pappins Road/Helen’s Hill Road intersection to Frances Creek Bridge to widen the existing pavement and build a new, wider bridge over Frances Creek. Identified flooding spots will also be addressed, with major culverts in the vicinity of Pappins Road and Pennas Road, as well as upgrading a series of rural intersections along this stretch of the Bruce Highway. The project will reduce the frequency and extent of road closures at Cattle and Frances Creeks, providing economic and social benefits. Works will reduce the frequency and extent of road closure at Cattle and Frances Creeks, improving freight efficiency for north-south inter and intra-state truck movements. It is anticipated that the project will reduce the existing time of closure for this section of the Bruce Highway in a major flood event from the existing 74 hours to around 19.5 hours, and will reduce the Average Annual Time of Closure (AATOC) of 29 hours down to around 3.5 hours. The Australian Government has committed up to $95.1 million towards the project, in partnership with the Queensland Government. Construction works commenced in April 2017 and work was completed in December 2018.